Located in the heart of Southern California skate culture, Venice Beach, the long awaited skatepark opened to the public in late 2009. Designed by RRM Design group and Zach Wormhoudt, a skater and landscape architect, the new 16,000 sf beachfront park is one of the most challenging arenas for skaters to ride. 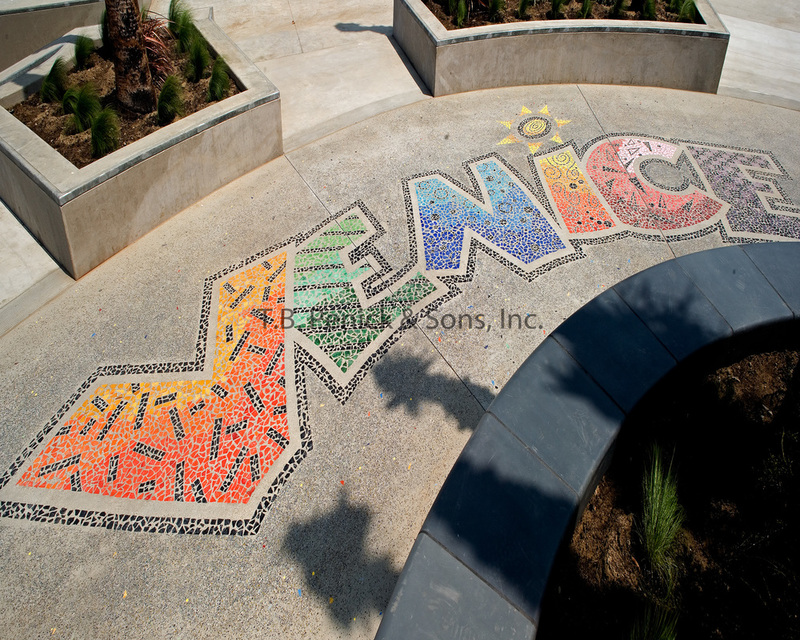 The project’s entry plaza features LithoMosaic art created with tiles from Cuernevaca Mexico. The tiles were hand set on mesh similar to standard Mosaics but were embedded into the concrete while still in its plastic state. The piece spells out “Venice.” Project manager Paul Tseng of the Los Angeles Department of Public Works Bureau of Engineering Architectural Division said, "Considering that Venice is the birthplace of the skateboarding sport, this is an iconic project.